Henry Holt and Co. (BYR), 9780805098396, 40pp. All the orangutans are ready for a nap in the sleepy depths of the afternoon . . . all except one. This little orangutan wants to dance! A hip-hop, cha-cha-cha dance full of somersaults and cartwheels. But who will dance with her? 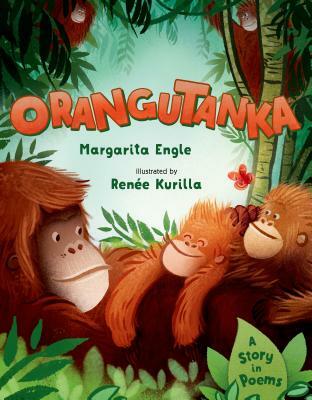 Written in bold poems in the tanka style, an ancient Japanese form of poetry that is often used as a travel diary, this exuberant orangutan celebration from acclaimed poet Margarita Engle will make readers want to dance, too! Renée Kurilla has illustrated many books for children, none of which include this much fur. She, her husband, and their fluffy cat, Timmy, can be found in Boston, Massachusetts, approximately 9,410 miles from the Borneo rain forest.